Ranger Mellenthin was shot and killed in the La Sal National Forest. The 34-year-old victim and two associates went to a sheep camp on Pine Bluff, a few miles north of La Sal, looking for an army deserter. 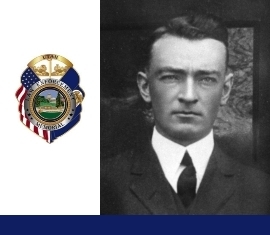 Upon locating the suspect, Ranger Mellenthin informed him that he was under arrest. The suspect and a companion immediately fired on the posse, striking Ranger Mellenthin three times. Before dying, Ranger Mellenthin shot and wounded the deserter. The two surviving members of the posse retreated to La Sal where they summoned help. The wounded suspect and his companion were subsequently arrested and convicted of second-degree murder. The army deserter served six years before being paroled. The second suspect’s conviction was overturned by the Utah Supreme Court in 1920. Ranger Mellenthin was married and the father of children. He is buried in Grand Valley Cemetery, Moab. His bronze name plaque is sponsored by the Davis County Law Enforcement Administrators Association. Rest In Peace Grandad, your family will never forget you. As an employee of the same and a fraternity sister, I’m thinking respectfully on this man’s sacrifice.